Jonathan Dwight Jones, professionally known as Jon Jones is an American professional mixed martial artist. He is currently signed with the Ultimate Fighting Championship (UFC). He is a two-times UFC Light Heavyweight Champion, as he won the undisputed championship once and interim championship once. He also became the youngest champion in UFC history after winning UFC Light Heavyweight world championship at the age of 23. He is ranked number 3 in UFC pound-for-pound rankings. He holds many UFC records in the light heavyweight division, including the most successful and consecutive title defenses, the longest win streak, the most wins, and the most submission victories. He holds the record of most consecutive light heavyweight title defenses in the UFC history with eight defenses. He was initially suspended for a year after United States Anti-Doping Agency (USADA) ruled the positive test came from male enhancement pill. His UFC Light Heavyweight Championship was also stripped from him. He again failed another USADA drug test in 2017 and his third championship was reversed. He faced a potential four-year ban. However, he was suspended for fifteen months for not enough evidence to show he was intentionally taking banned substances. The Alexander Gustaffson and his team have released a long statement questioning about the Jon Jones situation for positive drug testing situation handled by CSAC. He is the same Alexander Gustafsson who was defeated by Jon Jones via technical knockout in the third round at UFC 232 on 29 December 2018. Following two drug tests suspension earlier, he became eligible to fight again as of October 2018. With the rise of further inconsistencies following the drug test on 23 December 2018, he was not granted a license to fight in Nevada. Thus, his fight event was moved to Los Angeles, where he defeated Alexander Gustafsson. Then, CSAC did not take any disciplinary action against Jones as they stated that there was no evidence that Jones had re-administered a banned substance and no performance-enhancing benefits recently. With the light of recent events, as he tested positive for traces of a long-term metabolite of oral Turinabol in a sample collected a day before his fight with Gustafsson, Gustaffson's team released a statement which expressed their displeasure about the way they handled the situation and called the whole situation an absolute mess. He is the youngest UFC champion in the UFC history. He is regarded as one of the greatest professional fighters of all-time and ranks at number 3 in UFC pound-for-pound rankings. He has never been defeated for a championship in MMA competition. Jon Jones was born on 19 July 1987. He was born to Arthur Jones Jr. and Camille Jones in Rochester, New York in the United States. He holds American nationality. He has 3 siblings, Chandler Jones, Arthur Jones, Carmen Jones. His older sister, Carmen, died of brain cancer, at the age of 17. His zodiac sign is Cancer. He follows Christianity. He attended Union-Endicott High School. He used to play football as a defensive lineman at the high school. He also won a national JUCO championship at Iowa Central Community College. He then attended Morrisville State College, from which he dropped before completing his graduation. 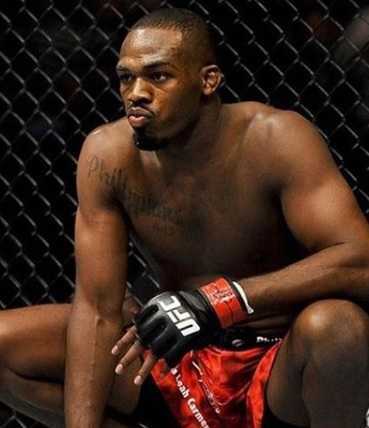 In April 2008, Jon Jones made his professional MMA debut. Before signing with the UFC, he won USKBA Light Heavyweight Championship defeating Moyses Gabin at BCX 5 via TKO in the second round. In August 2008, he made his UFC debut against Andre Gusmao at UFC 87, where he won via unanimous decision. On December 5, 2009, he was disqualified against Matt Hamill at The Ultimate Fighter: Heavyweights Finale. Jones won the "Knockout of the Night" award against Brandon Vera in March 2010, where he won via TKO. Jones won the "Submission of the Night" bonus after he defeated an undefeated Ultimate Fighter winner, Ryan Bader via submission on 5 February 2011. He defeated Mauricio "Shogun" Rua via TKO on 19 March 2011 and became the youngest UFC champion ever. He first defended his championship title against Quinton Jackson in September 2011, becoming the first UFC fighter to submit Jackson. Jones bout with Alexander Gustafsson in September 2013 was given several names, "an epic battle", "instant-classic", "Fight of the Year", "Greatest light heavyweight title fight of all-time", and "one of the greatest fights in the UFC history", as both were sent to hospital after the fight. Jones won the fight via a controversial unanimous decision. He was stripped of the belt and suspended from the UFC for a hit-and-run incident in 2015. His suspension ended after six months. He faced the second suspension for a year after USADA tested him positively. NSAC also suspended him for a year. In 2017, he faced the third suspension after USADA confirmed his test positive for Turinabol. His recently re-captured UFC Light Heavyweight Championship winning against Daniel Cormier was stripped off. Jon Jones is currently engaged to Jessie Moses. They first met at high school. They started dating while in high school. They got engaged in 2015. The couple is blessed with 3 daughters, Leah, Carmen, and Olivia Haven. He lives in Ithaca, New York. Jon Jones stands at a height of 1.93 m i.e. 6 feet and 4 inches tall. He has a body weight of 205 lbs i.e. 93 kg. He has an athletic body build. He has black eyes and black hair. As of 2018, his net worth is estimated at $12 million. He earned almost all of his fortune fighting as a mixed martial artist. He is considered one of the successful fighter in the UFC history. He is the first ever MMA fighter to be sponsored by Nike at the international level. He is also the first MMA fighter to have his own shoe line. He was also the first MMA fighter to represent Gatorade and MuscleTech in the Octagon. Previously, he has endorsed Reebok. Many consider his only loss against Matt Hamill via disqualification, a bad referee decision. He initially began fighting in MMA to raise money to support his pregnant girlfriend. He holds a blue belt in Brazilian Jiu-Jitsu and a black belt in Gaidojutsu. He was the first MMA fighter to represent Gatorade and MuscleTech in the Octagon. Once, he and his two coaches, chased, tripped, and held the robber, who broke the stranger woman's car and tried to ran away. In 2012, he pleaded guilty to DUI charges for driving under the influence and had to pay $1,000 fine, install ignition interlocks on all of his vehicles, complete a victims impact class, and his driver's license was also suspended for six months. He has been criticized for repeatedly poking his opponents in the eyes. In April 2014, he was accused of writing homophobic slurs to a Swedish man over Instagram, which he claimed that his phone was stolen and his account was hacked. He was fined $50,000 and was ordered to undergo 40 hours of community service by the Nevada Athletic Commission for an altercation with Daniel Cormier during a promotional event in August 2014. He served 18 months of supervised probation and 72 separate charity or youth outreach appearances after he pleaded guilty to leaving the scene of an accident caused by himself, crashing his rental car with two other vehicles leaving an injured pregnant woman behind.